The Museum collection is housed in a building of local stone, listed on the Register of National Estate and comprising a schoolmaster's residence and attached schoolroom (c.1873). The display highlights the history of the Merimbula-Pambula area & identifies some well known local individuals, such as Syms Covington assistant to Charles Darwin, William Mckell who was later Governor General of Australia. Adults $2, Students free, Bus groups $1 per person. No wheelchair access, small range of relevant publications for sale, research undertaken, guided tours by request, school groups by special arrangement. 500 items plus estimated 600 photographs. Photographic displays, artefacts and business records relating to early local industries and families e.g. The Maizena factory and the Munn family, mining, oyster growing, dairying & South Coast Shipping. There is also a small general collection of antique clothing, domestic items and furniture. The School, built 1873 of local sandstone extracted from a nearby quarry. It had the teachers quarters as part of the building. The school had the Eastern end gable added in 1905 and the teachers rooms became classrooms. The building was used as a public school until 1946. 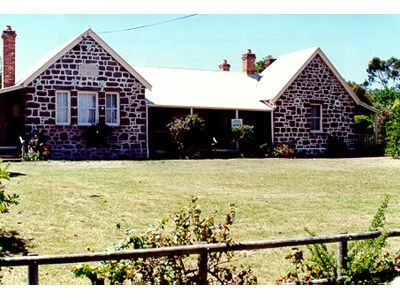 The Merimbula-Imlay Historical Society took it over in 1973. Housed in the Munn room at the Old School Museum the medals show the quality of Maizena produced by the early pioneer, Mathew Munn. The cornflour product won prizes in Paris, Dublin, London, Sydney and Melbourne from 1865. This dress was offered to an opportunity shop as part of an estate disposal and was rescued by a member of our historical society. An embossed brocade ladies morning dress. This gown was part of the wardrobe of a well to do English Lady, whose family (Blundell) migrated in the 1860's, settling in Victoria. A calve length boot, dating back to the 1890's, was found wedged in a tree at the flood level of a creek in the Pambula mining area. This girl's boot, dating back to the 1800's, was found wedged in a tree at the flood level of a creek in the Pambula mining area in 1992.